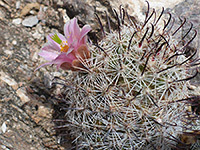 Mammillaria grahamii (also known as mammillaria microcarpa) is the most common fishhook cactus in Arizona, and the only one found in the Phoenix area; here and in other places it is usually dwarfed by the huge opuntia and saguaro nearby, being small and often partly hidden by bushes and grass. 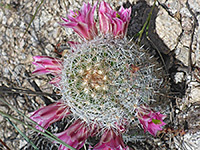 It becomes more visible in spring and summer when the pretty pink flowers open, arranged in a neat circle a little way below the apex. 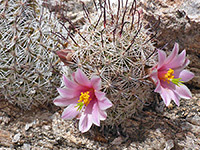 These are followed by long, thin, red fruits. 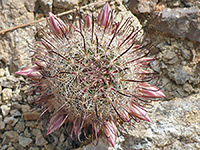 Plants may be solitary or part of small clusters; stems are between 1 and 2.5 inches wide and reach a maximum height of 6 inches. 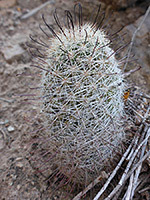 Spines are short but numerous; 26 to 33 per areole, mostly bristly white radial spines but with 1, 2 or 3 longer and more central spines that are dark red-brown in color and strongly hooked at the end. 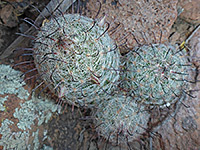 Areoles are at the end of tubercles which are fairly well visible through the spines, unlike the more densely covered mammillaria tetrancistra.